Chocolate Shimmer Ink ($22) can be described as a dark, chocolate brown with gold shimmer.The flecks of gold shimmer are very scattered and take some layering to show up on the eyes. I absolutely love the creamy formula of Bobbi Brown's gel liners. I've had a few of these for a couple of years now and they haven't dried out compared to many other brands that I've tried. Chocolate Shimmer Ink has a nice, creamy and smooth formula. It felt a tad drier than the other gel liners initially, but warmed up a little with use. It goes on like a light, neutral brown but the intensity is buildable. 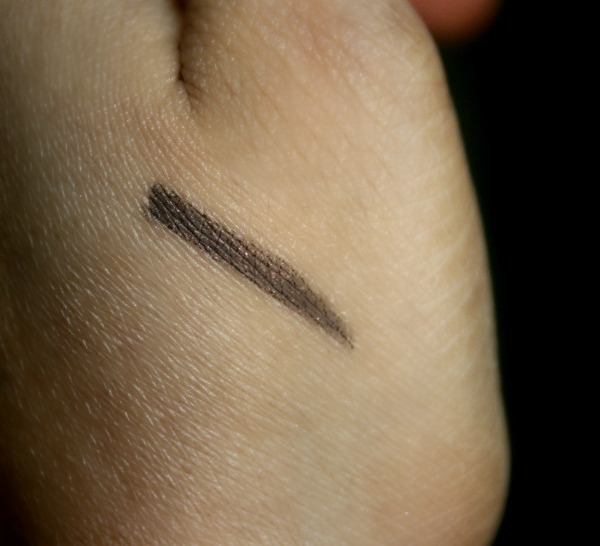 The shimmer doesn't show up that well with a single swipe, but I would still not recommend it for the waterline because of the tiny flecks in there. This is a great color if you want to go softer with your liner and works great on its own. It also smudges beautifully when you want to create a soft, smokey eye. Like most of Bobbi Brown's gel liners, this one too stays put for hours together. The color is perfect for everyday or anytime I want to keep my eyes low-key with just some liner and mascara. Overall, the amazing formula and the beautiful color of Chocolate Shimmer Ink makes it a perfect pick. The subtle shimmer adds a nice twist to your regular brown liner and is very flattering, whatever be your eye color! Have you tried the Bobbi Brown Long-Wear Gel Liner in Chocolate Shimmer Ink? That's a really cool shade! I have yet to try their liners but they seem really nice! I have the black one and i've had it for years! defo stays on all day! Looks nice on your eyes. I love eye makeup. Esepecially to wear when I am singing on stage. Makes a difference. I mostly try Avon eyeliners but this seems like it would be nice. Maybe I'll try it out.